Spoof news: Jesus Makes a Confession: " I messed up…"
Jesus Makes a Confession: " I messed up…"
In a late afternoon press conference, Jesus made a shocking confession: "I screwed up." "I don't get to say that very often, but remember that I'm only mostly divine, you know? Nobody's perfect - well, except my dad. The Creator rarely messes up, except for Canada, even he admits that was a mistake." When asked what he had "screwed up," he explained. "Well, there was all that talk about the world ending in 2012, right before my birthday, December 21st. I was supposed to come down, since I was still was working in the family business, and make sure everything ran smoothly with the End Times. My old man was worried that the Days of Revelation could really go bad and he didn't want another Dark Ages on his hands. He pretty much never recovered from that one in the history books. Anyway, I got off track there. I was supposed to handle the situation, but I looked down and everything seemed fine so I figured I would just take Mary and the kids down to Florida for a few weeks. She had been breaking my balls for centuries to go to Miami and see Peter and Paul, do a little fishing, you know? So, I go away for a few weeks and apparently, well, I dropped the ball." Jesus further admitted that he thought things "were just fine" when he went on vacation in 2012, so he never bothered to check back on the world and what was going on "down there." "That's when the whole End-Times thing started, all because I wasn't doing my job." One reporter pressed Jesus for specifics. The Alpha and the Omega responded by stating what he believed was the obvious: "This whole Trump thing, of course. Isn't it obvious?" The Blessed One deferred to his old friend, mouthpiece and PR man, John of the New Testament fame: "It's true. 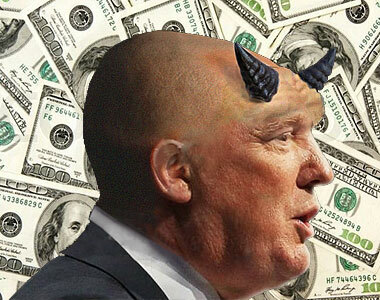 Trump is, as far as we can tell, the Beast of the Book of Revelations. All the signs are there. We've definitely looked into this. Take into account his hair, which is a sin, every time he opens his mouth it's total blasphemy - against everything basically - and, yes, he derives his power directly from the Devil himself." No one in the shocked crowd questioned that Trumps hair was a sin, or the quality of his speech, but several clamored to ask what proof existed that Trump's power was diabolical. Joseph then gave the floor to his long-time adversary and rival, Lucifer. "We usually don't work together on these big projects, maybe a small economic recession or a collapse of the housing market or an earthquake in Haiti. Usually, Jesus's dad handles the big stuff, but he's tired of the business, so we got together, and, yes, I can tell you that Trump does derive his power directly from me. It was totally a bad call on my part. I mean, hey, he's a salesman. He could sell me a pitchfork if he had to, but he's out of control. Quite frankly, one guy with that much power is bad for business." "We're bringing Jesus out of retirement to handle this one," Joseph announced to the buzzing crowd of reporters. It says right there in the Good Book that he's the only one who can handle this kind of thing." Asked if this meant the long-awaited Second Coming, Jesus was supremely cautious. "Wo, wo, wo, let's slow it down, people. I don't want to start making promises we can't keep here. Let's not start throwing around that kind of weighty language. Besides, you know, retirement's made me kind of soft. I don't know if I'm ready for another forty days in the desert or another crucifixion. I'm no spring chicken. " Joseph closed the press conference by assuring everyone that, although no concrete details had been put in place, the rest of the Apostles would be rounded up, and with the assistance of Lucifer and his dark minions, the forces of both light and dark will combine to battle this Sign of the Times.